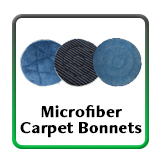 Microfiber Carpet Bonnets | 13", 15", 17", 19", 21"
We carry these industrial microfiber wet mops which may be the best conventional wet mopping product in the world. 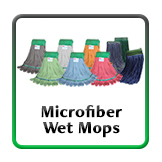 These microfiber wet mops are produced with a woven terry type of microfiber fabric that is sewn into approximately 1” tubes and then into the wet mop. They are energy efficient to process, bacteria resistant and do not need to be used with any chemicals to provide excellent cleaning of any type of flooring. 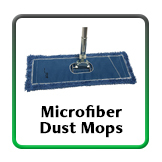 These microfiber dust mops are some of the most durable energy efficient dust mop products you will ever find. 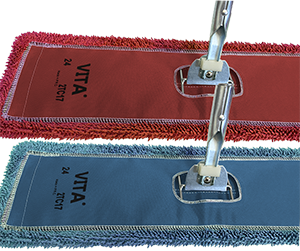 Our Industrial microfiber closed loop dust mop is constructed with an 80/20 blend microfiber yarn that contains loops which are twisted closed for maximum dirt and dust pick up and retention along with more durability. 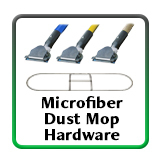 These closed microfiber loops along with the Industrial heat set dust mop backing make the product more durable, and more effective than other microfiber dust mops. 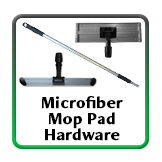 Our Aluminum Microfiber Mop Frames/Handles lead the industry in quality & durability. The aluminum extension handle is approximately 39” long when completely collapsed and approximately 70” long when fully extended. Our handle utilizes a twist to lock/unlock method making it very easy to use. 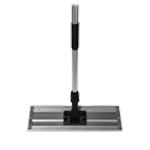 Our aluminum bases are approximately 5” wide and contain two strips of locking Velcro. 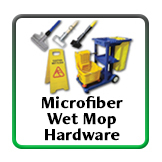 Our Microfiber Mop Recharging Buckets are constructed for wetting Microfiber Mop Pads prior to use. 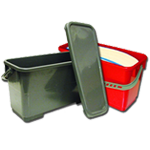 These buckets are standard size and will fit on most maid carts. 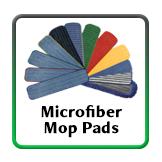 They will hold up to 6 gallons of cleaning solution or approximately 20 cleaning pads depending on the type of pad being treated. 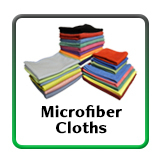 © Copyright 20165 www.MicroFibersInc.com. All Rights Reserved.